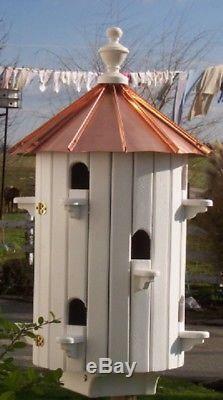 10-Hole Bird House with Low Copper Roof Amish Made in USA. This 10 Hole Bird House has a Low Copper Roof. Uses top-of-the-line construction, materials, and design by a. Uses 3/8 pine which is given a generous coat of weather-resistant white ZAR Rain Stain on the outer slats and perches to protect it against damage from the sun, rain, snow, and mildew. The standing seam copper roof is topped with a decorative lathe-turned finial. The solid brass hook & eye latch unites the hinged sections securely and facilitates easy cleaning. Nside construction uses 5/8 pine. For 4" x 4" post mounting (not supplied). 2" high x 14" diameter. The item "Bird House 10-Hole with Low Copper Roof Amish-made in USA" is in sale since Tuesday, October 31, 2017.